Your body naturally produces creatine from amino acids, the building blocks of protein. Creatine produces energy for your muscles to sustain short-duration, intense exercise. A large amount of water is bound to creatine in the body, and creatine can help draw more water into muscles. However, you might experience creatine bloating or creatine water retention if a large amount is not absorbed. Creatine can cause water retention, which can give you a bloated feeling. Creatine is made from three amino acids: glycine, L-arginine and L-methionine. Your muscles add a phosphate group to creatine to create phosphocreatine and charge it with energy. During exercise, phosphocreatine recharges ATP, adenosine triphosphate, the primary source of energy in your muscles. Energy from the creatine system is rapidly generated during early exercise. According to a 2016 study published by Sports Nutrition and Therapy, creatine has been shown to enhance physical performance — particularly sprinting, maximal strength and power output. The chemical properties of creatine cause it to carry a large amount of water, called a hydration shell, around with it. Increasing the levels of creatine in your muscles increases the volume of water in your muscles, temporarily increasing their size. If your muscles do not absorb creatine, it sticks around in your body until your kidneys can remove it via urine. Before it is removed, this excess creatine can cause water retention and bloating, according to ICON Nutrition. This can leave you feeling smooth and spongy. In the short term, creatine bloating primarily is a cosmetic problem, but consistent creatine water retention can place additional stress on the heart, blood vessels and kidneys. Your muscles might absorb creatine supplements only when they are absorbing nutrients. Take your creatine supplement around when you exercise to maximize this absorption. Avoid taking large amounts, especially when you're not exercising. Be sure to take creatine with plenty of water, as it increases the risk of dehydration, which can cause you to retain water and bloat in addition to the direct effects of creatine. If you continue to feel bloated when taking creatine with plenty of water and during exercise, reduce your dose or stop taking it all together. This will correct bloating within a few days. Consult with your doctor before taking creatine if you currently are under medical treatment. Serious side effects are related to severe dehydration, as creatine significantly increases your body's need for water. Many supplement makers recommend consuming an extra 64 ounces of water when taking creatine. This need increases further if you are exercising intensely, for a long duration or in a hot environment. Consuming large amounts of creatine can cause kidney damage. You should avoid taking this supplement if you are on medications that also negatively affect the kidneys, according to Mayo Clinic. Other side effects of regularly consuming high doses of creatine include dizziness, diarrhea, nausea, cramping and other gastrointestinal discomfort. Be sure to inform your doctor if you consume creatine or other workout supplements. 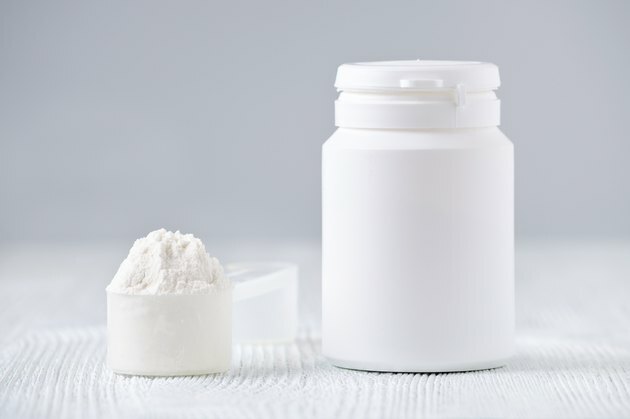 Read more: What Are the Mental Side Effects of Creatine?